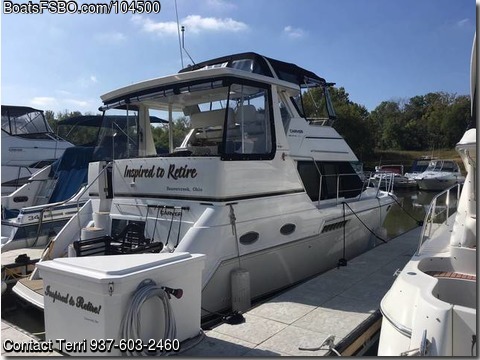 Boat is located in Cincinnati,OH.Please contact the owner @ 937-603-two four six zero..We are selling our wonderful Carver for another larger Carver! You won't find many as clean as this one! This boat is truly ready to enjoy without any known issues. We had all the impellers replaced last fall while it was in dry storage for the winter (not that they were needed, but we like to do that on a regular basis, we replaced both heat pumps last year, we installed new canvas and SeaDek which is still under warranty through Louisville Detailing, we have a new lowrance navigation on panel, the refrigerator is just two years old, the carpeting is new and looks great, we had the exterior wet sanded last fall and buffed, the engines are both gasoline and have less than 375 hours. It truly is a great boat for the price. We are not interested in trading obviously! Don't wait long because in searching in boats for sale, there isn't anything that compares for this price! This boat is a second owner boat, no pets, and used by non-smokers. It has a 150' anchor chain, new mooring ropes, new power cables and a new depth finder! The bilge pump is new too! Call 937-603-two four six zero for a showing! We are not listing it with a broker at this time! Who wouldn't want a wonderful boat that is truly ready to enjoy! This boat has always been in fresh water and we are the second owners. We know the first owners too! It also has three new batteries and a new forward shower pump station. It is ready for a new wonderful owner. There is still 3+ months of great boating weather to enjoy! We will store this boat for the winter rather than take a beating on a great running, great looking boat!